In June, Kazakhstan fell victim to homegrown terrorism. On June 5, a group of about 20 unknown armed assailants stormed two gun supply shops and a National Guard base in Aktobe (Northwestern Kazakhstan) in a vaguely coordinated assault that initially left 4 gunmen, a police officer, and 2 civilians killed. The gunmen started with an attack on a gun shop, took off with some weapons, and split into two groups: the first one went on to pillage armory while the other unsuccessfully tried to storm the military base with a stolen bus. At least 7 assailants were arrested in the aftermath of the shootouts and the authorities immediately set up an “anti-terrorist operation” to track down the remaining gunmen who managed to disperse. The police operations heated up on June 6 when at least 19 people were killed, including 12 gunmen, 3 police officers, and 4 civilians. Prime Minister Karim Massimov consequently declared that the highest level of terrorist alert would be adopted in the Akotbe region and Defense Minister Imangali Tasmagambetov placed all military units in a state of emergency, amidst a media and Internet blackout set up by the authorities in the name of national security. After several days of troubling silence, President Nursultan Nazarbaev made a public statement on June 8 where he presented the attackers as “followers of radical pseudo-religious currents who received instruction from abroad”. The official State rhetoric used to describe the attacks went with “radical, non-traditional religious movements”, clearly a cover for Islamic terrorist groups. President Nazarbaev made the most of his statement to warn the population against the dangers of “color revolutions”, outlining the fact that “where these revolutions succeeded, there is no longer a working state and stability, only rampant poverty and banditry” remained – a message directly aimed at the massive anti-land reform protest movement that sparked throughout the country in late April. The leader also tasked the government to draft new anti-terrorism, anti-extremist, and gun control laws. On June 10, the National Security Committee (NAK) finally tracked down and terminated the remaining 6 surviving attackers in Aktobe, while other suspected terrorists were arrested on June 12. Overall, 18 gunmen were killed and 9 arrested, for a total of 26 people killed since June 5. 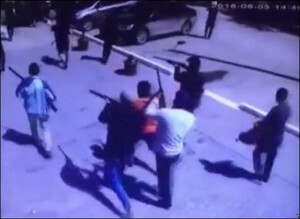 The Aktobe attacks took an official Islamist tone on June 14 when the Interior Ministry announced that an “Imam from Syria” (whose name remains unknown) was responsible for pushing the Kazakh assailants into action. Yet if the “Syrian connection” looks quite appealing to the authorities as a way to dodge responsibilities, it fails to recognize that the problem came from within with the threat of homegrown terrorism. In this, about 27 assailants – from a group of roughly 50 young men loosely affiliated around the same faith-based structure – suddenly decided to act on their convictions and carry out the attacks, thereby explaining the lack of proper planning and timely preparation. Their initial goal was to storm gun shops in order to stockpile weapons and ammunition and thus prepare for larger attacks, probably on public institutions and government symbols in the Aktobe region. The group could be considered an ad hoc and independent terrorist sleeper cell since it gradually self-radicalized through contacts with Islamic propaganda material (present throughout the Internet and elsewhere) before deciding to act out spontaneously. They might have been triggered by a radical preacher and its extremist discourse on that day. Unsurprisingly, nobody claimed responsibility for the attacks – and especially not Syrian-based terrorist groups. The Aktobe events might be a precursor to something worse in Kazakhstan: had some of the assailants been actually trained in Syria to genuine jihad techniques and urban warfare, the situation could have taken unprecedented proportions. The relative lack of internationalization of the Islamist movements in Kazakhstan, at least for now, plays in Astana’s favor. But this situation might not last very long: some 40 Kazakh nationals have reportedly returned from Syria since 2013. If they have all been arrested, there might come a day when some of them evade the authorities and start preaching extremist ideas and train others to jihad in Kazakhstan. This is especially worrying when considering the fact that Central Asians fighting in Syria alongside the Islamic State (ISIL) or al-Qaeda are well-trained, well-equipped, and increasingly “professionalized”. Also, in 2014, ISIL called Central Asians to carry out attacks directly in their countries: in the first 5 months of 2016, the Kazakh authorities already judged and incarcerated over 50 people for suspected acts of terrorism. Failing to recognize that the problem comes from within while blaming external factors will prove detrimental to the Kazakh authorities in their desperate fight against terrorism. In a highly strained economic and social context, radical Islam will undoubtedly become a favored mode of social protest and anti-government action. Mathieu Boulègue is an analyst in the field of Russia/CIS security and geostrategic issues. He currently works as a project manager for a risk management consulting firm. He is also a founding member of Sogdiane, a strategic think-tank on Eurasian affairs.